1. Thrown into a canal by a nurse-maid to prevent his tireless crying, Francisco Tárrega's sight was destroyed. Appropriately, his first guitar teacher was "the blind man in the marina". 2. We know the work of this 19th-century master of the classical guitar through a 13 note rendering of his "Gran Vals". This is known as the "Nokia Tune", the standard ringtone for that firm's mobiles for over 13 years. 3. The pine marten (or stoat) is now extinct in the region of its namesake, the Nokianvirta river. Nonetheless, the famous mobile phone company takes its name from the town on this river. 4. There is a myth in the UK that the stoat kills rabbits by sucking their blood. They do in fact attack through the neck, but only to best damage the core centers of the brain, and hence subdue their prey. 5. Granular synthesis is a method of sound synthesis that involves splitting a source sound into small grains along the time axis, and then recombining them at different speeds, amplitude, phase, etc. 6. Dennis Gabor was a Nobel Prize-winning physicist who theorised granular synthesis as well as holography, a form of three dimensional image storage. 7. 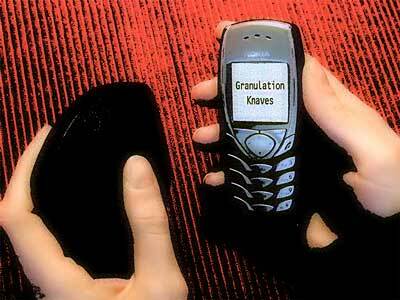 "Granulation Knaves" is an anagram for "Gran Vals Nokia Tune". 8. This is also the title of a piece for Nokia mobile, miscellaneous transducers and software synthesis. It will be premiered tomorrow at Soundings 1031 by escalation 746. Core centers of the brain may be affected, but there is no risk of blindness. This article is repeated over on the escalation 746 site.